Funeral Sermon for Jane Reynolds: "Jesus Makes All Things New"
St. John’s vision of heaven reminds us that God is the God who makes things. Maker of heaven and earth as we confess in the Apostles’ Creed. God creates and sustains us – and all creation – out of fatherly, divine goodness and mercy, without any merit or worthiness in us. We are God’s handiwork, his creatures. And in turn, we create. To be sure, our work of creation is much different. Though God has given us the gift of language, we cannot speak the words “Let there be light” and instantly turn on the sun. And yet one of the great wonders of God’s creation is that he instilled in us that same joy of making things. Jane shared in this love of creation. She spent many mornings tending her small, but mighty garden. Every time I would step into Jane’s living room I’d hear another story about the fine craftsmanship of one of her many antiques. She even loved to bake banana bread…though she couldn’t stand to eat it; so she gave it to her neighbors. And it was delicious. All these little facts reveal a deeper truth. That Jane’s love of creation and making things, especially for others, can only come from one place – the love of God which is ours in Christ Jesus. We love because God first loved us. Jane loved because Jesus first loved her, and gave himself to die for her…and for you. On days when she was feeling well it was the love of God in Christ which gave her such love for others. On days when she was sick or recovering from surgery or struggling with illness, there again, it was the love of Jesus our Great Physician sustaining her. And this love of God in Jesus –his dying and rising for you - sustains us, just as it did Jane – for this life, and for eternal life. In love, God created us. And in love he redeemed us. God makes us his children by water and word in Baptism, and calls us his own. And so God is not distant from his creation. For He saw the kind of world we live in, what his creation had become. How we live in a broken world of mourning, crying, and pain. Plants whither and decay. Even works of antique craftsmanship one day return to dust. Loved ones get sick. And eventually, we will die. This is what sin does; it attempts to unmake God’s creation. It seeks to destroy what God called very good. And so we pray the prayer that Jesus prayed for us, even as he died on the cross for us: Father forgive us, for we know not what we do. Jane prayed this prayer daily. Lord, have mercy on me a sinner. This too is our prayer. Lord, have mercy. And we pray, not to an absent God, but to the God who made man in his image…and who took on human flesh. The dwelling place of God is with man. God would not let his creation be destroyed. So the Creator became a creature to save all of creation from the curse of sin and death. The hands that formed the heavens and the earth are stretched out over the earth on the cross to save and redeem us, to make us God’s children. Jesus was born to bear our sin and be our Savior – for Jane, and for you. Jesus, the Son of God died, to make Jane, and all of us, children of God. Jesus was led up to the cross. Jesus was crucified between two thieves. Jesus the innocent gave his life for the guilty. His garments were divided. He bore the mockery. He bore the scorn. He bore our sin. He carried our sorrows. He made our sin, pain, and death his own. He died in our place. He was laid to rest in the tomb. And three days later, Jesus rose from the dead. This is how God goes about making all things new…for Jane…for you…for all. Behold, I make all things new. It is done! I am the Alpha and the Omega, the beginning and the end. To the thirsty I will give from the spring of the water of life without payment. The one who conquers will have this heritage, and I will be his God and he will be my son. And so we rejoice in the God who makes us his children, just as he did for Jane, through Jesus who makes all things new. Funeral Sermon for Ryan Willweber: "The Road Home"
Jesus had told Thomas and the disciples repeatedly where he was going. But they still didn’t understand that for Jesus, the road home goes through the cross. Jesus knew exactly where he was going. For not all who wander are lost. Jesus journeyed – through life, death and the grave – for Ryan, for you, and for all. Jesus loaded his shoulders with the burden of our sin. He prepared himself to die in order to prepare a place for Ryan, and us, with him. Jesus walked up the mountain. 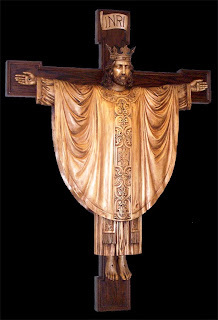 Jesus, crucified on the cross. For you. Our road home goes through Jesus’ cross. It’s a narrow passage with one door: Jesus’ cross. But it’s wide enough for all broken sinners. Jesus journeyed in life and death to save Ryan and you. And in this, Ryan and Jesus have something in common. Both loved to travel. Ryan - with friends and family. Jesus - for the love of Ryan, and you, and the world – journeyed to the cross. For Ryan there was always a new adventure, a new trail, or a new road to run down. Hiking, family vacations, countless miles in cross country. For Ryan and for us, the road home is Jesus’ cross. Ryan’s journey began on December 24th, 1997. The Willweber family celebrated two births that Christmas: One in Odessa, TX; the other in Bethlehem of Judea long ago. For unto us is born a Savior. Ryan’s journey began again in Holy Baptism on January 18th, 1998, his second birthday. And the angels in heaven rejoiced as Ryan received the new birth from above by water, Word, and the Holy Spirit. Ryan’s Baptism, like every Baptism, is a journey. Like Israel crossing the Red Sea, Jesus brings the baptized through the waters to the Promised Land. Baptism is our exodus. Baptism is our day of resurrection, just as it is for Ryan. Baptism buries us with Jesus, and raises us from the dead with Jesus. And from Baptism through childhood, Ryan’s journey continued. He grew in wisdom and stature before God and man. He traversed the pages of Scripture at home and church. God’s Word was a lamp to Ryan’s feet here in the shadowlands, as it is for all read, mark, learn, and inwardly digest it. Jesus’ Word is our life, even in death. For Jesus’ death is our life. This is Ryan’s Savior, and yours. Jesus died for Ryan’s sins, and yours. As the road continued on, Ryan confessed this faith at confirmation, hearing God’s promises in Isaiah 41: Fear not, for I am with you; be not dismayed, for I am your God; I will strengthen you, I will help you, I will uphold you with My righteous right hand. As Ryan continued to sojourn throughout life, Jesus fed and nourished him with holy food. This is My Body. This is My Blood. Given for you. Shed for you. Jesus journeyed to the cross so that when we journey to the Altar, Jesus’ body and blood are given to us, for the forgiveness of all our sins. Through God’s medicines of mercy, He sustains us as He did Ryan, in this unmerciful world. For we live in the shadowlands, where, in the words of Bilbo Baggins, it’s a dangerous business, going out your front door. We’re pilgrims in this broken world of car accidents and death; and we are broken by life in this world. Some wounds doctors can fix; others, only the wounds of Jesus our Great Physician can heal. We suffer. We grieve. We know tragedy. We journey under the cross. But we do not walk alone. We go in the peace of Jesus. And I will not say: do not weep, for not all tears are an evil. We weep to God who wept for us, as one of us. We lament to God who made our sorrows and Ryan’s his own. We grieve before God who has taken Ryan’s death – and ours - upon himself in His death on the cross. Today we might think that Ryan’s journey has ended. But we would be wrong. For we have Jesus’ words of comfort from the end of the road. Let not your hearts be troubled. In my Father's house are many rooms. If it were not so, would I have told you that I go to prepare a place for you? And if I go and prepare a place for you, I will come again and will take you to myself, that where I am you may be also. Our road home goes through Jesus’ cross. And it continues on the other side of the grave. In my Father’s house are many rooms. And each one of them with a view of the Lamb who was slain for us. And though we cannot wrap our children with an invisibility cloak as they head out the door, or take their suffering and death upon ourselves, there is one who can. Jesus has for you. Jesus’ death destroyed Death. 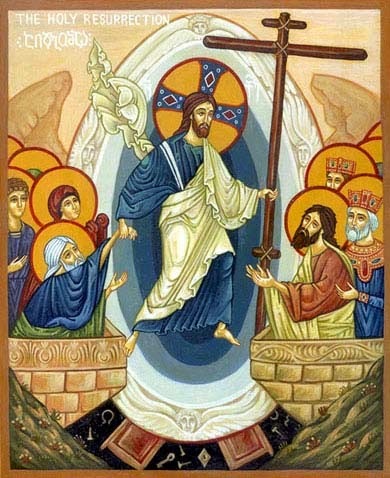 Jesus is risen. Risen for Ryan. Risen for you. Jesus has taken the road home head of us, and for us. And if God is for us, who can be against us? He who did not spare his own Son but gave him up for us all, how will he not also with him graciously give us all things? We grieve, but not without hope. Hope such as we hear in a travel song from one of Ryan’s favorite books. Let not your hearts be troubled. Hope in Jesus. For in him we rejoice. Ryan is home. He is with Jesus in the undying lands. And through our tears we glimpse our heavenly home on the horizon. And we wait with Ryan, for the resurrection of the dead and the life everlasting – that great, eternal homecoming with Jesus. God’s people held in Pharaoh’s hand. The Truth, the Life, our hope and stay. You shed Your blood to bring us home. Can ever keep us from Your side. With joy we’ll reach our journey’s end. Easter 7 Sermon: "Jesus Prays for You"
Most of the time when Jesus prays in the Gospels, we don’t get to listen in on his prayers, like when Jesus leaves his disciples to pray by himself on the hillsides of Judea. Today we get to participate in a little divine eavesdropping. We get to listen in on Jesus praying in the upper room. The same upper room where Jesus washed the disciples’ feet; where he taught about the coming of the Holy Spirit, the Comforter; where he instituted a holy meal with his holy body and blood in the Lord’s Supper; where he prayed with them and for them. This is known Jesus’ High Priestly prayer. On the night before he intercedes as our great High Priest by offering himself for us on the cross, he intercedes on our behalf as our great High Priest by offering his prayers to the Father. Jesus prays that you would be kept in the baptismal name that has been washed over you with water and Word and his Spirit. He prays that you would be one with him and with the Father in the unity of the Holy Spirit. He prays that you would be kept from the evil one, and kept steadfast in his Word of truth. He prays that you would be holy by his Word which fills your ears, purifies your hearts, and declares you to be his child. Everything Jesus prays for is for you. Now, it might seem strange to have a reading from the night before Jesus’ crucifixion on the Sunday after the Church celebrated his ascension. But this actually makes perfect sense. Jesus’ high priestly prayer gives us a glimpse into what Jesus is doing now at God’s right hand. Jesus is our High Priest. Jesus intercedes for us. Jesus prays for you and with you. And think about what this means. When you’re struggling with what college to go to or where God’s calling you to serve, Jesus is praying with you and for you. When you’re wrestling with how you can possibly forgive someone who’s sinned against you, Jesus is praying with you and for you. When you’re at the hospital sitting by the bedside of your grandparent, spouse, or child praying for their health and healing, Jesus is praying with you and for you. When you’re stricken with grief over the death of a family member or close friend, when you’re asking God “why?” Jesus is praying with you and for you. When you’re crying out to God in agony over your pain or someone else’s, Jesus is praying with you and for you. When you’re praying for a restoration of faith for that child or grandchild, or best friend who’s fallen away, Jesus is praying with you and for you. What comfort and peace it brings us to know that the same Lord Jesus who shares in our humanity, who bore our sin, sorrow, and death, who ascended to heaven, now stands in the Holy of Holies above, at the Father’s right hand praying for you to abide in his Word. This is why Dietrich Bonhoeffer once wrote that the richness of the Word of God ought to determine our prayer, not the poverty of our heart. For without the Word of God all is lost. Without taking time to read, mark, learn, and inwardly digest God’s Word, how will we know when someone is twisting God’s Word or leading us astray? All we like sheep have gone astray. Without a steady diet of the solid food of God’s Word and the daily bread of Jesus’ body and blood, how will we be able to give a reason for the hope that is within us? We will starve. Without the sword of the Spirit how will we remain steadfast in a world that hates us as it hated our Lord? We would be devoured. For this – and for all our sins – Jesus our High Priest intercedes. Jesus prays. Sanctify them in the truth; your word is truth. Our High Priest takes in hand our weak and faltering prayers and voices them to His heavenly Father – and he is heard. Jesus petitions the Father not to keep track of your iniquities, but to count only the drops of blood He willingly shed for you – and he is heard. Jesus prays His Father to keep you steadfast in His Word and truth until the end – and he is heard. And you are kept. Jesus’ cross and prayer are inseparable. 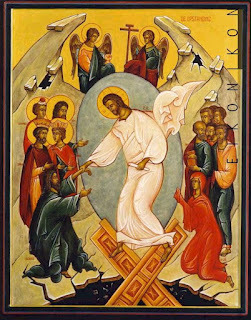 Jesus dies, rises, and ascends. And still he intercedes for us because of the cross. We pray in light of Jesus’ cross and in hope of what Jesus accomplished for us on the cross. That is where the joy Jesus talks about is found – in his cross. In the Word he declares from the cross: It is finished. This is what makes us holy – not what we’ve done or avoided doing - but what Jesus has done for you. By God’ Word the disciples were sanctified, set apart and called, to declare God’s Word of truth. It was the Word that made them holy, nothing else. So it is for us. God’s Word sanctifies us, sets us apart. Jesus takes his Word, water, and cleanses us in his sacrificial death on the cross. Jesus takes his Word, bread, and wine, and offers his body and blood sacrificed on the cross for you, to give you his holiness, forgiveness, and salvation. Everything that is holy - Holy Baptism. Holy Absolution. Holy Communion. The Holy Christian Church. The Holy Ministry - all of these are holy by the Word of Jesus, the Holy One who shed His blood for the cleansing and forgiveness of all. To you be the glory forever…. Ascension Sermon: "Jesus Blessed Them"
You can learn a lot about a person simply by looking at their hands. Married, engaged, or single. What they do for a living, hobbies or instruments they play. Every scar, wrinkle, and line has a story to tell. If hands tell us a story, what story do Jesus’ hands tell us? Neither of St. Luke’s accounts of Jesus’ ascension tell us what words Jesus spoke as he blessed his disciples. But we need only look to his hands and we shall know. In the hands He raised in blessing we can read the meaning and blessing of Jesus. These hands wiggled with joy and all our human littleness and frailty as he nursed from his mother Mary. These hands learned to hold a quill and write the words of Scripture that Jesus knew so well by the time he was examined in the temple at age 12. These hands worked with hammer and saw in the wood-shavings of Joseph’s workshop, sharing and blessing our work with us. These are the hands whose hallowed touch brought sight to the blind, speech to the mute, and whose hands removed impurity. These are the warm hands teeming with life that took hold of a little girl and brought her back to life. 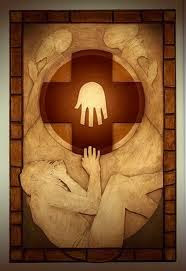 These hands stretched out, touched, or grasped with that personal, individual love that marks the healings of Jesus. He could’ve healed people by the dozens with the snap of his divine finger. But instead he was there for each one that needed him, holding their weak and frail flesh in his own. These are the hands that gathered the little children in his arms to embrace them and bless them. These are the hands that gripped and rescued Peter as he looked away from Jesus and began to sink. These are the hands that Thomas saw and worshiped as doubt gave way to faith. All of this is in Jesus’ hands as he blesses the disciples, as he blesses us. All of this and more. For in each of Jesus’ hands remains a little red badge of redemption – for the disciples, for me, for you, for the world. In Jesus’ hands we see the mark of the nails. Those jagged, glorious scars which give us Jesus’ blessing and proclaim how it was won for us. All of our pain, our deepest sorrows, our every grief, our innumerable sins, even the cold grip of death were held in those hands. And by those hands Jesus has overcome every one of our fears, sins, and death. Every scar, wrinkle, and line of Jesus’ hands proclaim the story of your salvation. All the sin that our hands – and minds and hearts – have wrought – is paid for by Jesus’ hands. Because Jesus’ hands were stretched out on the cross for you, today they are once again stretched out in blessing for you. And that means that we’re sinners in the hands of a merciful God. Cross and blessing go together, especially on Ascension Day. After all, Jesus didn’t raise his hands in blessing that day only for his disciples, but also for you. Jesus’ ascension is a day of hope and joy for us. 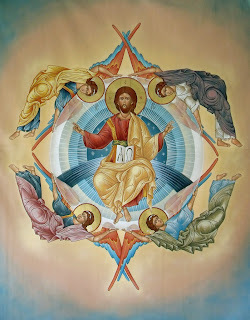 Jesus’ ascension, as we confess in the Creeds, is to the right hand of God the Father Almighty. Though this isn’t some particular place. Jesus isn’t locked up in a distant heavenly throne room. The right hand of God is the exercise of the whole power of God, which now is in the hands – the crucified, risen, and ascended hands – of Jesus. Or in the words of St. Paul, Jesus ascension is his coronation. 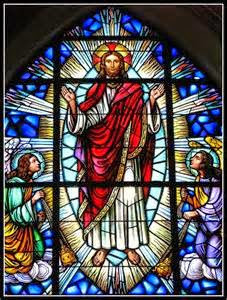 Jesus is King of kings and Lord of lords, who has ascended far above all the heavens, that he might fill all things (Eph. 4:10). Jesus is now seated at God’s right hand in the heavenly places, far above all rule and authority and power and dominion, and above every name that is named, not only in this age but also in the one to come. And he put all things under his feet and gave him as head over all things to the church, which is his body, the fullness of him who fills all in all. And this is good news for us, just as it was for his disciples. Though you cannot see Jesus’ hands; they are still here in his Church blessing us. Jesus’ ascension brings Jesus closer to you, not farther away. Jesus’ ascension allows him to be present with his church, to fill the earth with his human body and with those hands of blessing. So when the pastor puts his hands on your head, pours water over your head, and baptizes you – his hands are merely instruments of Jesus’ hands. When the pastor places his hands upon your head and pronounces “You are forgiven all your sins” – his hands – and more importantly his word of forgiveness – is Jesus’ forgiveness. When the pastor’s hands place into your mouth and your hands Jesus’ body and blood, this is Jesus work of blessing for you. All of this happens because of Jesus’ ascension. Jesus is not absent; he is our ever-present Lord and brother. 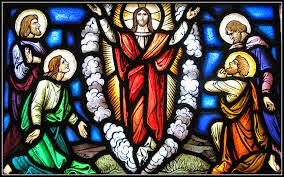 The miracle and wonder of Jesus’ ascension is that he continues to raise his hands in blessing for his Church, for you his people. Wherever his word of repentance and forgiveness of sins is proclaimed; wherever Baptism, Absolution, and the Lord’s Supper are given for the remission of our sins – there are Jesus’ hands raised in blessing. 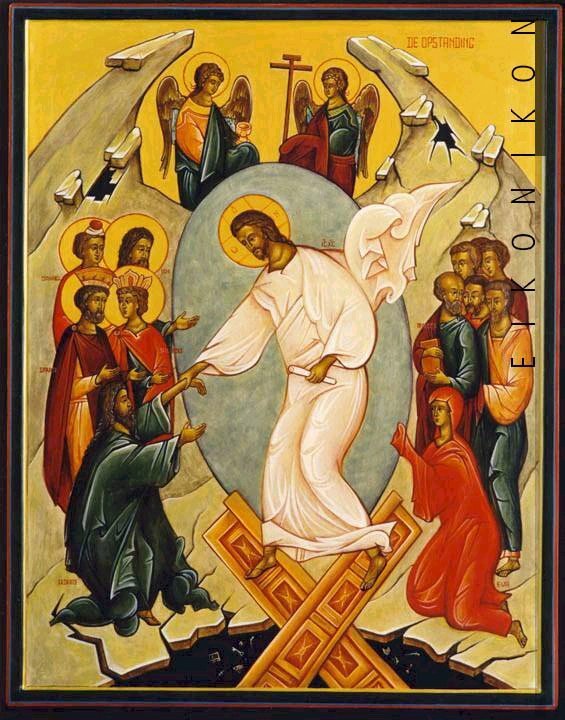 Today we join the disciples in worshiping our crucified, risen, and ascended Lord with great joy. Easter 6 Sermon: "Abide in My Love"
How do you abide in Jesus’ love? Do you set up a tent? Hold tight to those warm-fuzzy thoughts? Put your mp3 player on a constant loop playing “Bring back that lovin' feeling”? But Christian love, God’s divine gift-love is much different. If God’s love for us was simply mushy-gushy feelings, he wouldn’t have gave his only begotten Son to die for you, he would’ve sent us emojis on our iPhones. Thankfully, God’s love for us is not like a teenage girl’s love for My Little Ponies and kittens. It is more than a feeling. God’s love is action. Jesus feeding thousands. Jesus healing the sick. Jesus casting out demons. Jesus teaching. Jesus praying. Jesus bearing our sin. Jesus laying down his life for sinners. Jesus rising from the dead. This is the way Jesus loves. He gives himself. To abide in Jesus’ love is to receive what Jesus gives; and then to give what you have received. This is the pattern. The Father gives all He is and has to the Son. The Son gives Himself back to the Father, and gives Himself to the world, and for the world to the Father, and thus gives the world (in Himself) back to the Father too. (C.S. Lewis, The Four Loves, p. 1-2). So, follow Jesus’ words downstream. From the Father to the Son (by the Holy Spirit) to you. And from you to others. Abide in my love, Jesus says. As the Father loves the Son, so the Son loves you. Don’t skip over this and think, “great…now on to the really important stuff.” No! This is the important stuff. Without God’s love for you in Jesus, nothing else matters. Abide in my love. Remain. Rest. Dwell. And never depart from Jesus’ self-giving, sacrificial love for you. This is where “love” begins – not in our hearts, not in our decisions, choices, or our initiative. It begins in the heart of the Father and His love for the beloved Son. It flows to you from the Son by way the cross, the font, the altar, His Word. And what does Jesus’ love look like? If you had to draw a picture, how would you illustrate it? A heart, as in “I heart 90’s grunge rock”? A diamond ring? How do I love thee? Let me count the ways…one carat, two carats, or three?! Or since it’s Mother’s Day, perhaps a mother’s love for her child. She quite literally lays down her life to bear, feed, and nurture her child. Now this is closer to God’s love than the other kinds of love we have: romantic, friendship, or affection. But it’s only a picture. After all, only Jesus’ love is perfect. Our love – even on our best day – is soiled with sin. The first commandment calls us to fear, love, and trust in God above all things. And yet we fear no one, love only ourselves, and trust no one. “We give our human loves – friendship, romance and sexuality, affection, enjoyment of God’s creation – the unconditional allegiance we owe only to God. Then they become gods: then they become demons. They will destroy us.” (C.S. Lewis, The Four Loves, p. 8) This is not love. This is idolatry. This is what our sin does to God’s love: twists, turns, mangles, and warps it, and the end result is always the same: self-love. Repent, for we have not loved God with our whole heart; and we have not loved our neighbor as ourselves. We have not let his love had its way with us and so our love for others has failed. Where our love is selfish, Jesus’ love is self-giving. Where our love is envious, boastful, arrogant, rude, resentful, irritable, and insistent on our own way, Jesus’s love for you is patient, kind, enduring, and bears all things…yes, even unlovable, loveless, despicable me. God’s love in Jesus, covers the multitude of our loveless sins. In this is love, not that we loved God but that he loved us and sent his son as the propitiation for our sins. For God showed his love for us in this, that while we were still sinners, Christ died for us. Jesus loves the loveless. We who were his enemies, sinners, are now his friends. And according to Jesus the picture he wants us to have of God’s love is his sacrifice. 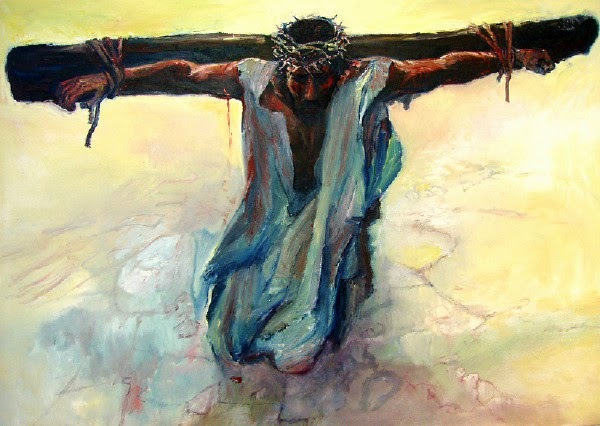 Here is love: Jesus crucified for you. 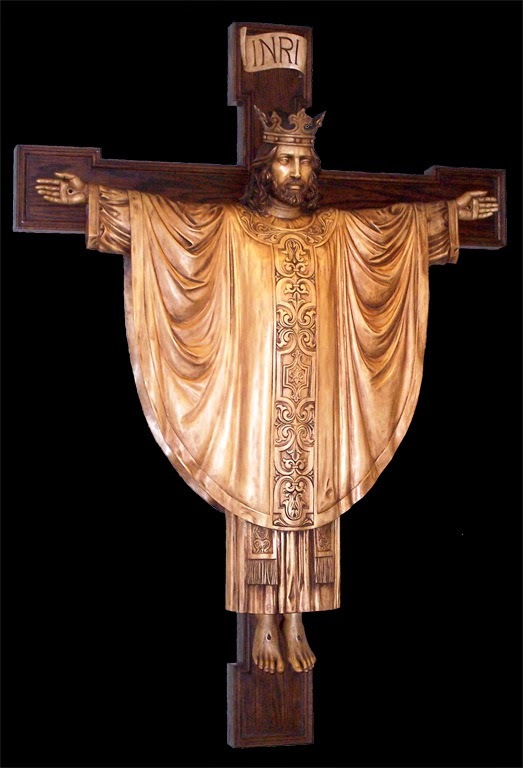 “God…creates the universe…already seeing the buzzing cloud of flies about the cross, the flayed back pressed against the uneven stake, the nails driven through the mesial nerves, the repeated suffocation as the body droops, the repeated torture of back and arms as it is hoisted up time after time, for breath’s sake. If we may dare the biological image, God is a ‘host’ who deliberately creates his own parasites; causes us to be that we may exploit and take advantage of him. Herein is love.” (C.S. Lewis, Four Loves, p. 127). Look to the font and where Jesus’ love is traced upon you in the cross; where God’s love is poured into your heart by the washing and renewal of the Holy Spirit. Look to the altar where Jesus feeds you in love, and gives himself in his body and blood to you. Look to the Scriptures where Jesus’ love for you abides. And wherever you abide in his word – in the Supper, in Confession, in studying and meditating upon his Word, in praying and singing it – you abide in Him, and he abides in you. These words I have spoken to you that my joy may be in you, and that your joy may be full. In fact, it’s more than full. Jesus’ love overflows. Jesus’ sacrificial love bears fruit in our sacrificial love for other. We love because he first loved us. You’re planted in him. Jesus is the Vine you are his branches. And his love will bear fruit in you. Imagine the look on your neighbor’s face when they see you cleaning the trash off their front yard without even asking for help. Imagine how that homeless man or woman will feel when you offer to buy them some food or give them some extra clothes or water. Imagine how the visitor to Redeemer will feel when you leave your group of friends to welcome them to church and invite them to join you in conversation. We love by sacrifice. In fact there is no love without sacrifice. We love in word and deed. We love by laying down our lives for others. We love others – not to get something from them or out of their wallet – but to give to them. To serve them. Love is praying for your enemies. Love is asking God to give us patience as we bear with people who are unbearable. Love is attending to daily devotions and going to confession and absolution, and receiving Holy Communion as often as you can. Love is looking not to your own good, but the good of your neighbor. Love is inviting your next door neighbor to hear the Word in church or bible study. Love is pestering your friends or family to have their children baptized without delay. Love is asking your brother or sister in Christ how they’re doing and taking the time to listen. Love is comforting someone who’s grieving with good news of Jesus who bore our griefs and carried our sorrows. Love is writing a card to one of our shut ins or someone you see in the weekly prayer list who’s in need. Love is telling others the Good News that God loves you in this way: Greater love has no one than this, that someone lay down his life for his friends. This is what it means to abide in Jesus’ love: to receive Jesus’ sacrificial love and to give in sacrificial love to others.